Tom’s recent research has focused on the animal welfare and species conservation consequences of the human usage of wildlife for recreation. In particular Tom works on the consumption choices of tourists and exotic pet owners. He recently conducted the first audit of the diversity and impacts of tourist attractions that involve close interactions with non-domestic (wild) animals. He also studied how information about the negative consequences of exotic pet ownership might affect potential purchasers’ desire to own a given pet. Tom graduated from a BSc in Durham in 1997 and from an MRes in York in 1998. 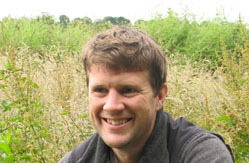 He completed his DPhil on water vole conservation ecology in 2003 in WildCRU. For his first post-doctoral position he designed and implemented a four-year replicated water vole reintroduction experiment in the Upper Thames, which resulted in the successful establishment of seven new populations of these endangered rodents. Before moving to his current topic he also completed a two year post studying the distribution and impacts of American signal crayfish upon British riparian flora and aquifauna, and a year investigating how the management of UK farmland may be expected to affect populations of European hedgehogs. His current project examines whether tourists are able to judge the impacts of wildlife tourist attractions, and whether tourists’ consumption choices can be influenced by reminding them of these.